The 2015 New York Fashion Week premiered this past week with a parade of fabulous designers and gorgeous models showing their best work. Glamorous Paper has picked some of the highlights of this year’s fashion week so you can imagine you were there, sitting front row next to Rachel Zoe and Heidi Klum. Zac Posen stunned with head-to-toe looks in this year’s hottest color: marsala. A smoky, dark red that looks luxe in fur, sequin, or leather. 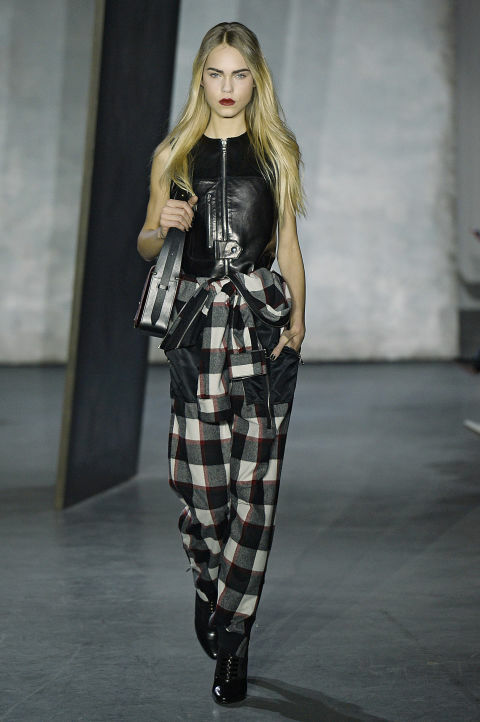 Phillip Lim dived into the comeback grunge style with lots of plaid and pleather. All of his looks featured tough, black boots and fierce lip colors. Dennis Basso was the epitome of chic with crisp whites, metallic shoes, and gorgeous fur coats. The mix of neutral colors, sleek hair, and winter furs was striking. Von Furstenberg redesigned the little black dress with sheer cutouts, bird decals, and patterned tights. The famous dress designer created the perfect blend of fierce, flowing, and formal. 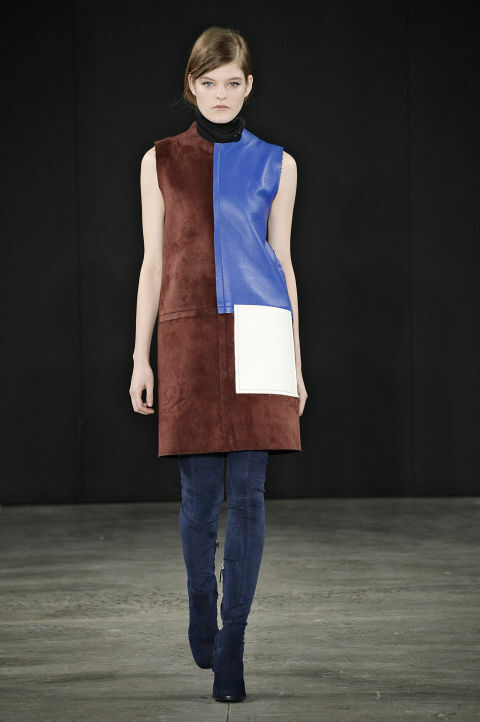 Edun went retro with 60’s style color blocking and mixed patterns. The geometric design and amazing thigh high boots in deep colors are a match made in heaven. Tibi managed to make a monochromatic scrap of fabric look SO good. The pastels and minimalistic makeup allowed the dresses and jumpers to stand on their own and flatter the models’ figures. Lapointe wins with swishy, flapper-style skirts and puffy sleeves. The oversized clutch adds a distinct level of sleekness. 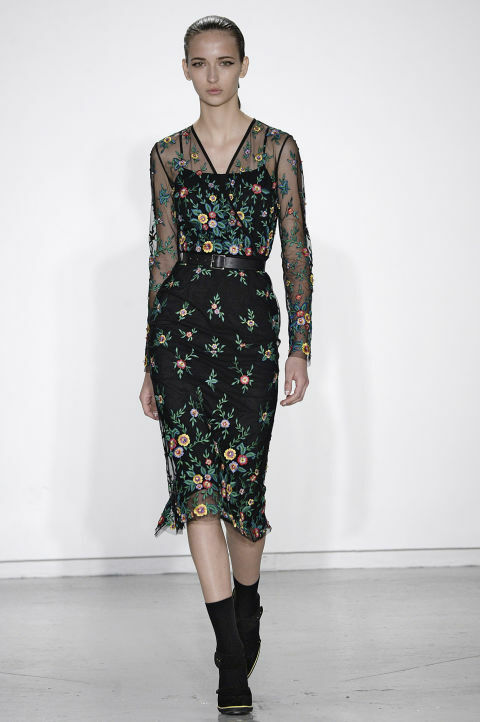 Suno’s mesh and floral dresses were drop dead gorgeous and, in my opinion, ready to wear. It’s a spring floral pattern combined with the chicness of black and belted to perfection. Has matching colors ever looked so good? The combination of a seamless dress, slit up to there, and a luxe fur coat made this designer a hit at NYFW. Comey basically displayed the perfect way to bridge winter and spring designs. A flowered jumpsuit, glittery blazer, and fun beanie create an eclectic and adorable outfit. Ermilio’s designs were red hot this season, whether with head-to-toe red or black lace skirts. 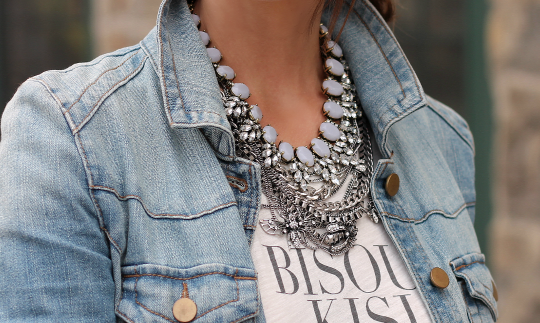 With a blend of classic and innovative, her line oozed trendy feminine. What did you think of this year’s NYFW? Let us know with the #GlamorousPaper on Twitter or comment below!